Personal Information: We use information to establish your i2i™ accounts, provide support for user's accounts, and to update users on updates and changes to the i2i™ site. We use return email addresses or phone numbers to answer the user inquires we receive. Such addresses and numbers are not used for any other purpose and are not shared with outside parties unless explicitly authorized by the user. User Authorized Sharing of Information: Within the registration process there is an option, if selected, will add your email address to a distribution list to receive information from i2i™ partners. These settings can always be changed within the users profile settings. We never use or share the personally identifiable information provided to us online in ways unrelated to the ones described above without also providing you an opportunity to opt-out or otherwise prohibit such unrelated uses. Our Commitment To Data Security: To prevent unauthorized access, maintain data accuracy, and ensure the correct use of information, we have put in place appropriate physical, electronic, and managerial procedures to safeguard and secure the information we collect online. Our Commitment To Children's Privacy: Protecting the privacy of the very young is especially important. For that reason, we never collect or maintain information at our website from those we actually know are under 13, and no part of our website is structured to attract anyone under 13. How You Can Access Or Correct Your Information: You can access all your personally identifiable information that we collect online and maintain through the My Profile tab, once you have logged in on the i2i™ Site. We use this procedure to better safeguard your information. You can correct factual errors in your personally identifiable information by sending us a request that credibly shows error. To protect your privacy and security, we will also take reasonable steps to verify your identity before granting access or making corrections. How To Contact Us: Should you have any questions or concerns about these privacy policies, please send us an email. Inda works in the public and private education sectors. We respect the privacy of all students. Not every project and case study is made public. Thus we live by “The Code”. All content is password protected unless explicitly released by the parent/student. 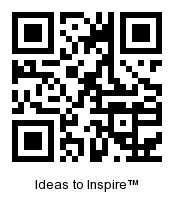 Scan this with your smartphone! This is a QR code (short for Quick Response). It's a barcode readable by camera phones (and web cams). When you scan it, you will instantly be linked to get exciting stuff and maybe even free music. Most of the newer smartphones have a QR reader. You should be able to scan the image with your phone (meaning use your camera phone to take a picture of it). If you can't do that, then you will simply need to get a little app to find out what all the excitement is about. The apps are free and easy to install on your phone. Go to your phone's App store downloads and search for QR Reader or Click here to find out how to download a mobile barcode reader.